This hooded scarf in gray is perfect for those who love unique accessories. 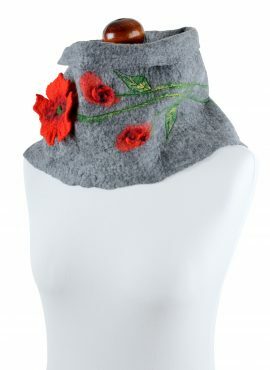 It is made of soft merino wool and has beautiful hand-shaped hood. 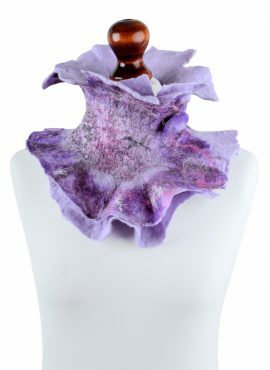 This lilac neck warmer has a unique texture and lovely colors. It is very feminine and romantic and it will give a lot of joy to every woman. This beige scarfie has romantic design and lovely colors with jade and red onion. 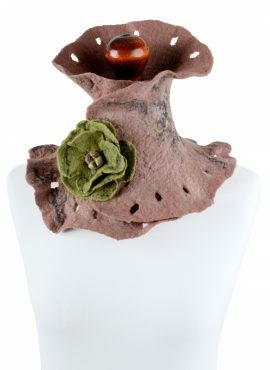 It is also equipped with aubergine brooch, which makes it a perfect gift. Felt cowl scarf felted by hand of natural wool in apricot color. It is soft and cozy, perfect for women, who appreciate uniqueness and comfort. 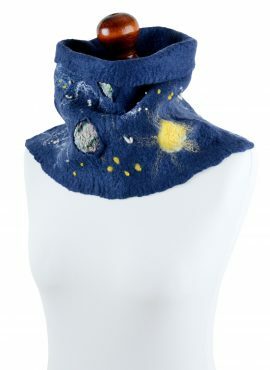 This navy blue cowl is perfect for women, who love space motifs in fashion. 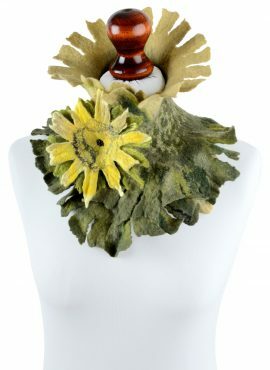 It has many hand felted details that make it a piece of wearable art. 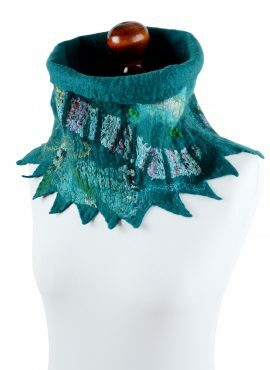 This fringed neck warmer has leopard print and nice ombre from sage to pearmain green. It is perfect for women with wild nature who love woodland style. 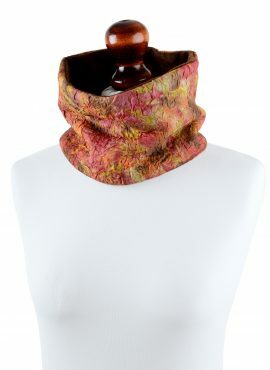 This rust neck warmer has amazing leaf design and woodland style. 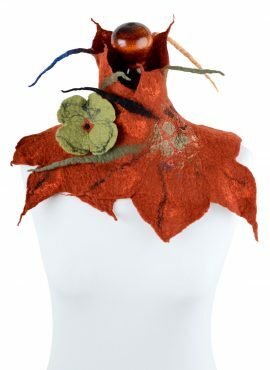 You can use it for a fairy costume or wear it as a fantasy women scarf. 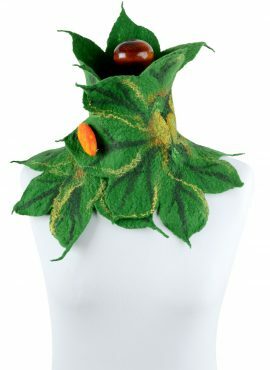 This leaf neck warmer is designed for all fairies, pixies and elven queens of the world. It will take you to the magic land where forest creatures live. This dark gray cowl scarf is femininine and versatile at the same time. It has a flower pattern and beautiful wrinkled texture. This beige neck warmer is perfect for women, who love cocoa brown shade. I accessorize it with a pickle green brooch that fits the scarf perfectly. 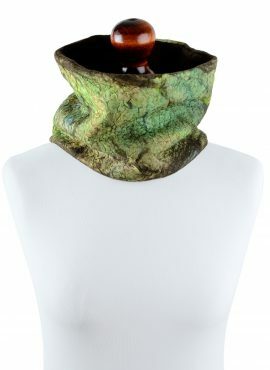 Felted tube scarf for women with amazing marble look. Thanks to merino wool lining it is warm and gives a solid protection against wind. 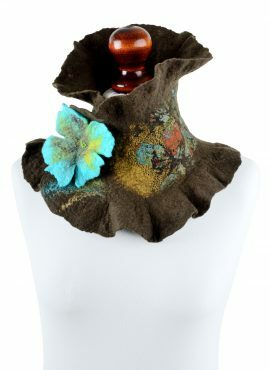 This brown neck warmer has ruffled edges and lovely turquoise flower. You can wear it from autumn to spring without getting cold or overheat. This teal cowl scarf is perfect for women and girls who love fantasy style. It has a unique sea green tone and designer spiky edge. 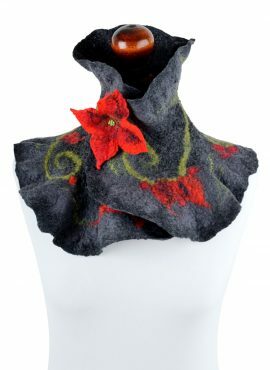 This red wool neck warmer is really chic and will be a lovely gift for her. 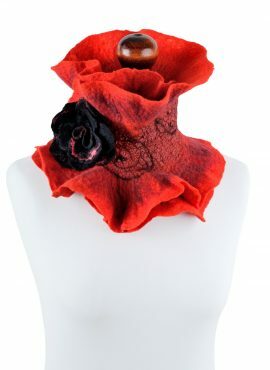 I sell it with black rose brooch that will let you easily fasten the scarf. 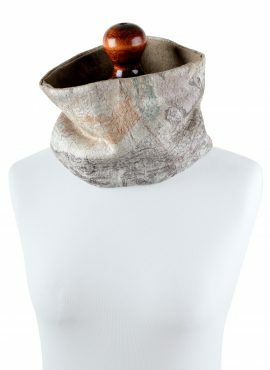 Natural tube scarf for women with amazing wrinkled texture and wool lining. It has a boutique desing and artistic look at the same time. 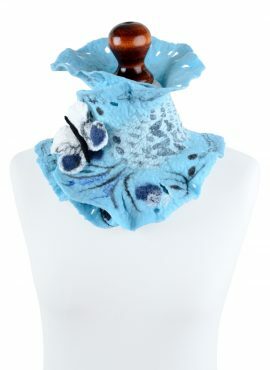 This sky blue neck warmer is playful and whimsical. It has romantic colors and an insect pattern with many butterflies, bugs, spiders and flies. 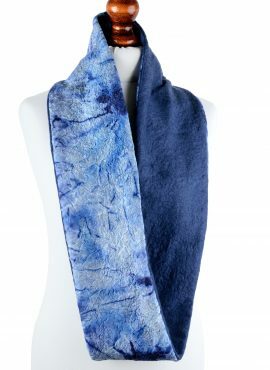 This blue mobius scarf is really special. It has a warm lining, consists of natural materials and has a wrinkled texture that makes it look amazing! 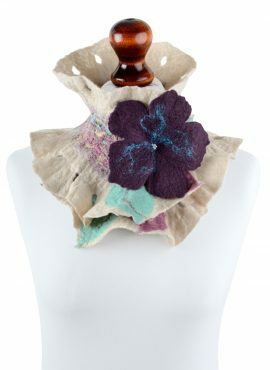 This aubergine collar for women has lovely eggplant color, feminine design with kind of felted lace and a beautiful flower brooch that comes with it! 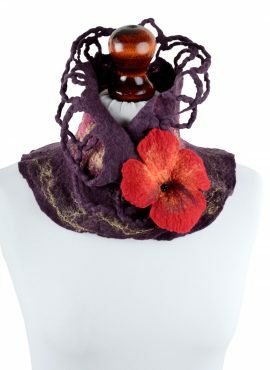 This gray cowl scarf has lovely red flower and floral motif with leaves and buds. It will make you look very feminine and romantic. 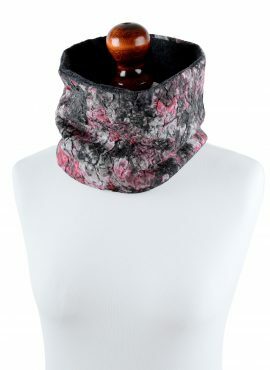 This charcoal neck warmer is perfect for women, who love natural accessories. It has a dark gray design, floral pattern and lovely flower brooch! This warm infinity scarf is perfect for winter. It has two layers, nice pattern and wrinkled texture. It will give you artistic look at every occasion.